I occasionally get emails from folks who come across my 2009 post about my interest in the Crossfit training philosophy. So I wanted to follow up with some updated thoughts on fitness, as I’ve moved on from this particular kind of workout and now adhere to a more traditional strength training program. As I wrote back then, I found Crossfit to be appealing for many reasons: It’s fun and different, it’s an extremely difficult workout, it offers variety, etc. But over time, I found that what I liked most was the focus on fundamental exercises like the deadlift, the bench press, the press, pushups, pullups and — most of all — the king of all strength training exercises, the squat. These are old-school exercises that are too often overlooked in today’s modern gyms. For all of my interest in Crossfit, however, I noticed that these routines were helping me refine my fitness broadly — but that due to the variation of Crossfit workouts, I wasn’t paying enough attention these most important exercises consistently enough to improve my strength much. Then I came across a book called Starting Strength: Basic Barbell Training . I recommend it enthusiastically. It’s the best fitness book I’ve ever read. Training with a barbell works better than using machines and isolation exercises. This is because with a barbell, you’re moving more weight over a greater distance, you’re using more of your muscles at once, and you’re doing so in a way the body is structured to work. To make progress, you simply must add weight to the bar over time. This is a no-brainer, of course, but many people go to the gym and don’t actually monitor what they do, and yet expect to improve their fitness and strength over time. You have to push your body to improve, to lift more weight, to adapt to new stresses, and to gain or maintain strength. 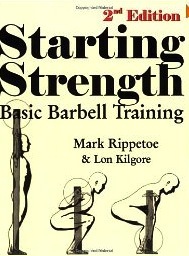 The book covers the squat, the bench press, the deadlift, the press, the power clean, and other exercises like pullups. It also has extensive photos and illustrations. My experience is that these core lifts, if done with sufficient weight and effort and consistency, deliver a superior overall workout than merely running or other “cardio” workouts or Crossfit-style high-intensity interval training/weight lifting/calisthenics. Moreover, because you must keep track of the weight you’re lifting, you’re inspired to keep improving and moving toward your goals. I especially like the focus on the squat, because that particular lift is so demanding, from a muscular and psychological perspective. For more info on the book, see the Starting Strength Web site, a review of the book at Cool Tools, and the Starting Strength wiki, which has a collection of Rippetoe’s coaching videos. Physical strength is the most important thing in life. This is true whether we want it to be or not. As humanity has developed throughout history, physical strength has become less critical to our daily existence, but no less important to our lives. Our strength, more than any other thing we possess, still determines the quality and the quantity of our time here in these bodies. Whereas previously our physical strength determined how much food we ate and how warm and dry we stayed, it now merely determines how well we function in these new surroundings we have crafted for ourselves as our culture has accumulated. But we are still animals – our physical existence is, in the final analysis, the only one that actually matters. A weak man is not as happy as that same man would be if he were strong. This reality is offensive to some people who would like the intellectual or spiritual to take precedence. It is instructive to see what happens to these very people as their squat strength goes up. “Starting Strength” is the number one training book on by bookshelf as well. It is worth mentioning that Mark Rippetoe was an active supporter of Crossfit, and there are still many references from ‘Starting Strength’ websites to Crossfit material. He and many other well known trainers don’t seem to endorse Crossfit anymore. Aside from personal conflicts that I don’t care about, the reason seems to be that the level of training at Crossfit affiliates is very inconsistent – they include many weightlifting exercises but do not teach the proper form. I’ve seen plenty of evidence of this on Youtube. Still, the principles seem sound especially for someone who already has strong foundation. Newley Purnell, Proudly powered by WordPress.